Looking out at the world from behind a Blue Star Banner. Life has gotten busy again. Oh, not just the busy-ness of church meetings, and house work, and cooking and the like....but REALLY busy. Kasey is here, and "the girls." Mya and Bella, lovable chocolate labs, and our Lilly make 3. Mya, the senior citizen of our family pets, is 11. The sweetest dog you'd ever want to know. With a little bit of hound in her, she kind of reminds us of one of the mystics from the movie, The Dark Crystal. Then there is Bella - sweet, and slightly rambunctious at just over a year old. Whenever you look for one of them, the other is sure to be close by. Lilly just tries to go with the flow and as long as nobody takes her spot on our bed at night, well, it's okay with her. Kasey loves them dearly....Mya was around for a few years before he was born so she's known us all for all of her life. And then there is the little man. Getting bigger every day - a little boy, but old for his years because of what life has brought his way in all the separations from his mom and dad. Still, and you only need to see Ron's man cave to know, that Legos and racing car sets, and books I (and a comfortable fuzzy blanket for watching movies with Grandpa) are still the things of little boys who are 8 years old. I love this. With Laurie and Stephen being gone, yet again, and even though they are together in a place where there is no war, it is still a hardship on all of our hearts. Sometimes things get a little difficult - especially at home work time, and I have to remind Kasey that we need him to do exactly what his mom and dad expect him to do at homework time....finish it! It's also in being Scott's and Violet's mom, and Veronica's grandma too. In getting the house ready for their visit in two weeks. And in praying for them all during every set back Vi has in her Crohn's disease. It's in loving a husband and father and grandpa who does so darned much around here even though he doesn't always feel well. Then there is friendship. God has blessed me so in the friendships that He's given me. Not just in all those I know and love here in CO, but long distance friendships....sisters, cousins, former co-workers I stay in touch with. There are strong Christians who touch my life daily, through their prayers and love for me and for my family. And a little boy named Kasey - I want him to know that Grandma is his friend too. Every day, to share something funny, or awesome, or just plain fun. Can life be any richer, or any more blessed than it is now? I know that it will be someday, when the greatest victory I have in Jesus is realized. Because of this, every new day - from sunup until sundown - there are opportunities to BE a blessing. Lord, let me bless others as You have blessed me. First and foremost, I am grateful for my faith - not that it is anything that comes from me, but is a gift from God. There are days when I know just how puny that faith can be. Days as a wife, a mom, a grandma when I forget that worry is something that Jesus died for. And that God's hands hold so much more than we can imagine....and the palm of His hand never lets anything fall. To live in a country where so many men and women have the courage to say, "Yes! I am proud to serve!" Where men and women who are sons and daughters, husbands and wives, mothers and fathers, decide that service to their country is a privilege, and that wearing a uniform every single day is an honor. That the boots they wear walk not just the streets of their military posts, or the decks of their ships, or the steps to the cockpit of their fighter jets, but also the streets and the sands of places far from home. To be the mom of two soldiers, and the wife of a Vietnam veteran, is a pride that is not a boastful pride, but rather a deep and abiding thankfulness. Today, Ron, Stephen, and I will go to one of the many restaurants in town offering and honoring Veterans and active military a complimentary meal. Laurie is still out of town for training, but hopefully will also decide to join some of her brothers and sisters in uniform for a meal as well. Kasey's school does not close on Veteran's Day....they used to honor veterans and active military with a special program on Veteran's day. I am saddened by the fact that they do not do this any more. It would be good if the many of the children who attend and are from military families would know that their loved ones are appreciated. It's good for ALL children to know their country is served and protected by a military which is strong, and courageous. And gratitude is something that humbles us....for we are nothing without the blessings God gives to us. No matter our accomplishments, or our job, or our financial status....we are nothing without gratitude to Him. He has blessed our country with the greatest military force ever given to a nation. May He give them courage, and some day soon, the blessing of serving once again in peace time. Thank a Veteran today, won't you? Or hug someone who is still serving. And please pray for a family whose soldier has given the ultimate sacrifice. So, now that we've been Colorado residents for a year - not just in the fact that we live here, but that we are full fledged legal residents - we've exercised our right to vote for the first time in awhile. When we went to get our Colorado driver's licenses last November, we signed up to vote by mail. Our ballots arrived a few weeks ago. The thing is, none of the names sounded familiar - except that we've seen the campaign ads and signs all over the place. So, our local newspaper published a special edition a week or so ago with the candidates, what their platform is, and a bio of sorts. That helped us a lot. Some might ask, why did we vote if we weren't sure of everyone who is running? And the reason is simple....it's a right our soldiers fight for. A privilege our soldiers are fighting for on foreign shores....in and for countries whose citizens don't understand what it's like to live in freedom. Anyway, I can't remember an election since the very first time I've been old enough to vote that I haven't exercised that right - except last year, when we hadn't been residents here long enough to vote. The names on the ballot were always familiar - names I'd come to know as I grew up and grown older. Still, despite some of the issues in our leadership today, I still vote with trust. I trust that those I vote for are the real deal....looking for an opportunity to make life a little better for the people they serve....in their towns, or cities...or their states. So that those who keep us free, and safe, will know they are fighting for something worthwhile. For this mom, that's important. It's a hope I have despite the current state of politics. Whether it's by pulling a lever, or completing a write in ballot, or submitting an absentee ballot, may God's blessing be on the people we elect this election day. They'll need every ounce of that blessing. As the Quaking Aspen trees shimmer their gold leaves everywhere we look, fall has come to CO, finally. The warm temps even into mid October kept the colors from turning until the past few days, at least here in the CO Springs area. Up north, in the higher elevations of Boulder and Estes Park, the leaves turned weeks ago and are past their peak. But the beauty is still there as snow covers the ponderosa pines and the mountain peaks. With fall, comes the ending games of America's past time - professional baseball's world series. Rather than risking a controversy by writing about my chosen team, :-) I'll continue on to soccer - Kasey's favorite sport, or so it seems. The games are fun to watch....seeing them running up and down the field, seeing the spills they make as their feet get tangled trying to get possession of the ball, while on the sideline, as we cheer, parents and grandparents are wrapped in blankets and sipping their travel mugs of coffee or tea. Last night's weather was perfect - the kids enjoyed playing in shorts and game jerseys instead of sweatpants and jackets. And afterwards, plenty of conversation at a local restaurant with the boys. And then there's football. I am still loyal to the Buffalo Bills, would like to see their season turn around, but as the season progresses, and Peyton Manning continues to lead the herd of Broncos, being a CO resident AND the love of a good game is turning me into a Broncos fan. Of course the Packers are still up there on my list too. If the Broncos and Pack should go to the Super Bowl, I would have quite a decision to make regarding favorites. Scott, Vi, and Veronica....we miss them. We're trying to save for a special trip early next summer so Kasey can see his mom and dad when they have leave from their next duty station. They will be leaving for this duty station after Christmas and Kasey will not join them since they (and Kasey, as well) do not want him to leave his school to go overseas for a year. So he and Mya and Bella will move in with us while they are gone. They will have leave time and we are planning a special vacation next June. But we still want to visit Buffalo next summer too....we'll probably take the camper to help on hotel and meal expense while traveling and also to make it more fun for Kasey. It might take us an extra day to get there, but it will be fun. And we can probably take Lilly too, saving at least $200 on kennel fees. As the winter approaches, we need to consider whether the possibility of them coming out here is possible in our budget too. They can't swing it themselves with Violet on disability, so we'll see what we can do. I checked possible air fares today and I am still in what you might call shock. Meanwhile, I've been pretty busy at church with choir, prayer group, teaching Sunday School, and our ladies retreat that just happened a week or so ago. Another whole year until we do that again, but lots of things to fill that time. Time goes so quickly, especially as we get, ahem, older. Meanwhile, know that I appreciate your visit here....will try to make it a worthwhile one and post more often. .....ever, will I forget where I was on 9/11/2001. Nor will those who died on that day, (and since), ever be forgotten. And the President who served our country on that day has my gratitude and love as well. God Bless America, and those who keep us free, and safe. We took the plunge yesterday....bought a camping trailer. 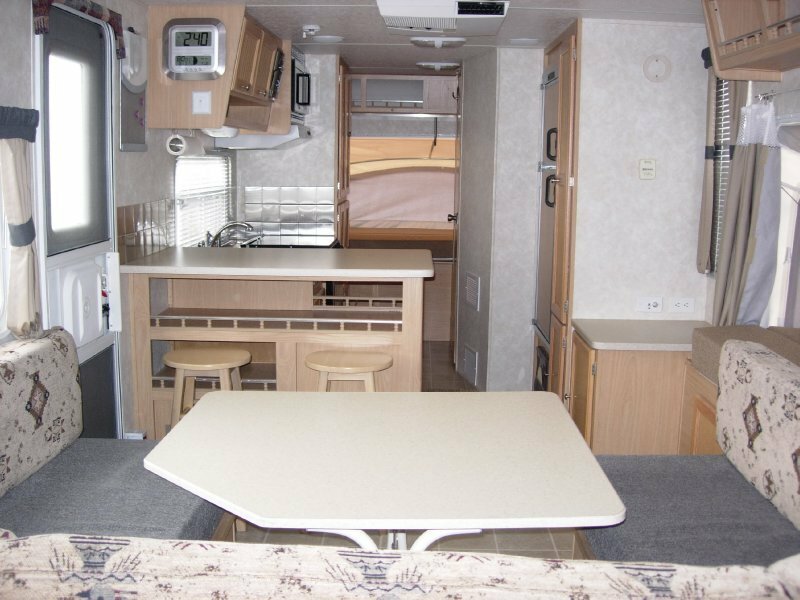 Sleeps 8, has a very comfortable layout inside, yet still bright and brings the outside in with bunks that pull out like a pop up, but living space is in a hard sided trailer. This means that we don't have to disassemble the dinette (which, does fold down into a queen size bed), or interrupt the living space at all. Perfect size, full bathroom with shower, and a great kitchen. See me smiling? 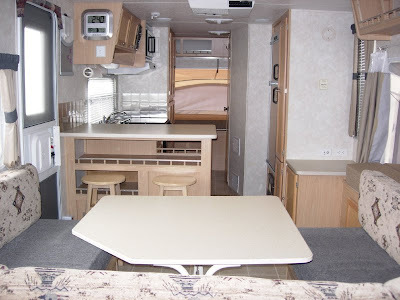 Not that material things are so important, but Ron and I are campers....when we sold our fifth wheel after we stopped traveling full time, it was like selling a home, not a camping trailer. I think full sized travel trailers are great, especially for those who can get a permanent site at a campground....perfect escape for the summer. But since that's not really an option for us, this will be just right. Camping is good~you get to meet people, and go places....maybe even to the Adirondack region...ahem. We've traveled there before when we lived in Buffalo, and camping is wonderful there. There are TONS of state parks in Colorado too, and to think we have the opportunity to see them now, up close and personal....VERY thankful to see God's creation. Kasey will claim his bunk the first time he sees it, no doubt, and since he'll be living with us for several weeks very soon, he'll get to use it before this year's camping season is over. I would be remiss, being a military mom, if I didn't say anything about the possibility of military action in Syria. I will just say that it's scary to think of getting involved in another war in any way possible. And yet, this is what our country does....for the sake of humankind. I am praying that whatever we do, it is for the right reasons. That's about as political as it gets for me, but stronger than anything political, is the will of God. For our country, and the world. Don't mix religion and politics, many people say. And yet, He holds us all in His hands....and in Him we trust. I can just picture Kasey or Veronica sitting on one of those stools asking me questions as I cook. Smiling here. No clue. I have absolutely no clue why I haven't been blogging. Days turn into weeks, those weeks into months. Busy doesn't quite cut it for a reason. It would only be an excuse. Life HAS been busy though. :-) Our two soldiers have been enjoying the wonder of being home with Kasey since December when Stephen came home from his deployment safe and sound. I was looking through some pictures yesterday...and, as I often do, took a look at the pictures of Laurie's homecoming. It seems like years ago, but has been 15 months. And I remember how joyful we were, and yet it was bittersweet because she was returning only a few weeks after Stephen began his time in Afghanistan and she knew that was ahead of her even as she hugged Kasey and savored being out of that horrible place. And yet, hope springs eternal in all of us. Our family will be experiencing yet another separation in several months. This one, however, has Laurie and Stephen going to a safer place....and going there together for less than a year. We will visit them, with Kasey, next summer. It will be a good trip, and God willing, His plan is for this as well. Kasey and the girls (Mya and Bella, both loving and wonderful doggies) will be staying here. It will be a busy time, yet Kasey will still be able to attend the same school he has been attending since he began elementary school. Homework, I suspect, will be one of the most stressful things for us all, but it's okay....we'll get 'er done! Laurie and Stephen have training to do this fall and will both be away for a time....we'll do a "training" run ourselves here as Kasey and the girls come here while they are gone. If the Army keeps it's promise, no Christmases will be missed for them and Kasey. But there will be a birthday party in there somewhere that Grandma and Grandpa will need to take care of. We're pretty experienced at those too. As time goes on, I never cease to be amazed by God's love and encouragement through family and friends. The prayers, and hugs, and even electronically....through FB, and emails, and an occasional text from a concerned friend. Those who have come into my life because of His directing me to our church, and those who are across the miles back in Western NY, or military mom friends from the four corners of our nation. I can only say that in the ups and downs of life, God is with us. And, busy as life gets, I can still hear His whispers. I guess that's one of the reasons you see this post....He reminds us of how important it is to pour out our hearts to friends. Thanks for listening again...I'll try to be better about this. Retired from my job at a university financial aid office for 7 years now, my life has been blessed over and over by the hand of God. He gave me Ron – my husband of 46 years...and our children (two of them), (one of each), and our son in law and daughter in law, not to mention 3 beautiful grandchildren. And He gave me faith to know Jesus as my Savior. Not by my own doing...as Ephesians says in His Word. He's brought me to three wonderful Lutheran churches....two in the Buffalo,NY area, and then here in CO. It was here in CO that I began what I call my second journey of faith...and where, in a hospital Cath Lab, my life was saved when I was on the verge of a massive heart attack. There is comfort in knowing that God has given me life three times....when I was born nearly 70 years ago, when He prevented my heart attack from happening, and, so long ago, when He gave me eternal life through His Son, Jesus. He has given me the gifts of the Holy Spirit, so that I can practice and show the fruit of the Spirit, and He has given me a heart to love Jesus. May all that He has given me be shared - for all of my life.